June 03, 2017 at 11:00 pm. 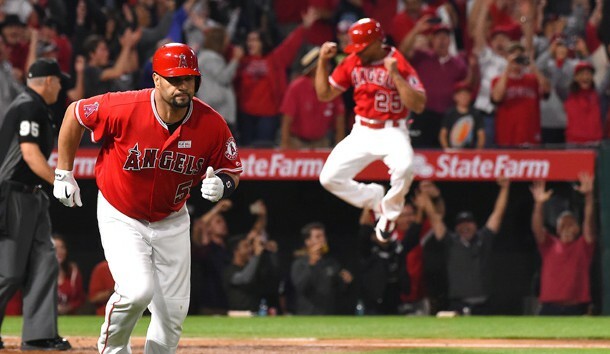 Pujols belted a 1-2 pitch from Minnesota ace Ervin Santana in the fourth inning to give Los Angeles a 7-1 lead. Pujols put a long, looping swing on the low pitch, and he briefly stood at the plate to see whether the ball would stay fair. When it did, he rounded the bases as fireworks exploded before greeting his excited teammates at home plate. Only Barry Bonds (762), Hank Aaron (755), Hank Aaron (714), Alex Rodriguez (696), Willie Mays (660), Ken Griffey Jr. (630), Jim Thome (612) and Sammy Sosa (609) have hit more home runs than the 37-year-old Pujols.